Just to give you an idea of what I HOPE is going to be the last time I show you these pattern pieces..and an idea of what I've been working on...a bunch of made-up & super-modified pattern pieces. This first one, you've seen. It's what the Bonus Basic Pattern recommended I do to modify the pattern so it fits better. The 2nd shows how I had to move the point of the bust dart down. And up close you can see that I added close to an inch along there to hopefully ease in enough fullness. The 3rd photo shows what I think the new neck facing should look like (front & back) based on the modifications to the bodice pieces (you'll notice in photos 1 & 4 that it's gone from a round neck to a V-neck). Also in this photo is the pattern for the collar. On the other 2 or 3 versions (I've lost count! ), this was actually the one thing I made up that worked quite well (here's one example). However, in that first version, the collar looked great & the facing worked well, but the neckline was quite big (lots of skin showing--not really what I wanted for a cozy winter dress). It's quite cold out at the Reference Desk--there's always a stiff breeze from the A/C, winter or summer, so I really didn't want direct air-to-neck contact, at least not in my cozy thin-wale corduroy dress. 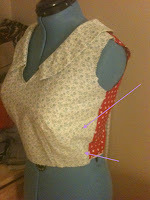 And in the 4th photo you'll see up close how I modified the front neckline. Then I just used this to create the facing you see in the 3rd photo. Do I know what I'm doing? Not at all. Am I going to get to the dress before we leave on vacation? Probably not. Will I have a ton of free time when we get home to finish it? Again, probably not--we'll be moving into the new south wing, a friend is visiting from the Netherlands to do research at the Library of Congress and we're headed to California to celebrate the Roommate's birthday w/ his family. Hmmm. But I've heard the winter is going to get quite bleak come Jan/Feb here on the East Coast--so that might motivate me to finish. Wish me luck in the new year! And thank you for your kind attention this year...I'm mostly enjoying blogging, but do find it a chore to keep my sewing up in order to write about it! 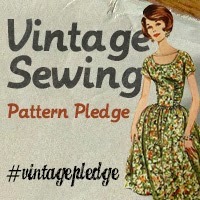 Not really, I love sewing, but am starting to pine for the days I only worked part-time! Who likes Kuba?! We like Kuba!! We went to see the Weaving Abstraction exhibition at the Textile Museum last Sunday, and it got me wanting to take a look at our raffia fabric. So, rather than take them out of their special box and risk getting them coated with dust (the south wing is under construction & wall board/sheet rock is just as dusty as you've heard), I just looked up the photos from the digital archive. On the right is a piece of kuba cloth. It's dyed woven raffia (the long inner fibers from palm leaves). And then the lighter designs are REVERSE-appliqued on! This particular piece is a men's ceremonial skirt, about 30" wide, but 14' (yes feet!) long. That's about 4.5 meters. The designs are amazing--graphic & modern. And not very easy to execute. 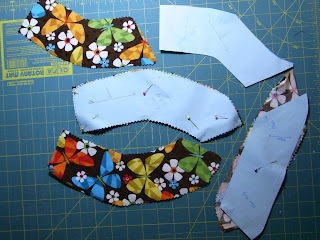 As I've said before regarding molas, applique is hard enougn; reverse applique--yikes! And working with raffia must not be easy either--it's stiff and breaks, unlike fabric or yarn. I suspect they do some of their work when the raffia is damp, to make it more flexible. The next three are also ceremonial skirts, which would be tied on with a belt. They are kasai velvet or raffia velvet. Think of a carpet, from Iran or Turkey, made with raffia, but without knotting. Amazing geometric designs, huh? The amout of work that must go into these is just amazing, and again, the tools are simple, but the artistry is exquisite. We bought all of these a a shop in Ouagadougou, even though they items were made in the Congo. Unfortunately the Congo isn't that safe, so Burkina Faso was where we did our kuba/kasai shopping! These three skirts measure about 2' square. 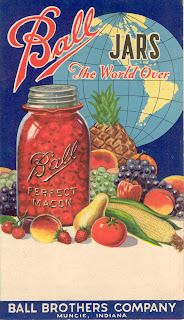 You really can't go much longer than that because the raffia fibers don't get much longer than 24-30". For the longer kuba cloth skirts, they are also 24-30" wide, but many squares are sewn together to get the length. We saw one at the exhibition that was over 30' long! If you'd like to see more amazing kuba & kasai, check out Hide & Seek Africa; their items are for sale, and the site gives a glimpse into the variety of designs these artists create. Here's a photo taken of young boys in 1970, showing how the extra long kuba cloth is wrapped around & around & then tied. Raffia velvet is rather interesting because both genders produce it. Generally speaking, men weave the base cloth from raffia (plain woven fabric), then women do the embroidery, creating the intricate designs & trimming the raffia to different lengths to create different pile heights. These different heights, different colors & geometric designs help to create true works of art--try to see them in person if you can! I was at a giant hardware store this morning buying closet organizing stuff for the south wing (which is being painted--getting close to being finished!). I decided to ask one of the employees about a small screwdriver for the extremely low clearance needed to get to the "frozen" screws on the needle plate of my sewing machine (less than 2" & the screwdriver that came with the machine doesn't work). And he showed me this (and 2 others in a packet for $3.88)! I took them home, applied them to the previously unmovable screws and Viola! In about 5 seconds I had both screws off. Amazing what the right tool can do! Lever + Screw = Ability to Move Universe! I vacuumed out under the needle plate, put the bobbin holder back in where it should be, and used the machine tonight to do all the darts on the bodice, and also finish putting the collar pieces together. My lovely Singer Quantum 9910 is running like a dream again. And I got 6 new tools, which I think will be useful elsewhere, not just in the sewing studio! I think this may qualify as an epic fail! 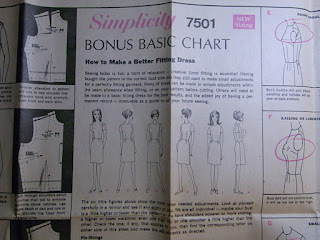 I was all ready to start sewing my 2nd try to create Simplicity 7051 out of Simplicity 7501, and my sewing machine went berserk. The bobbin holder moved, a lot, and I cannot get the screws out of the needle plate! This actually came up a few months ago, and right after I got it (15 months or so ago), as I usually clean out the machine when I start a new project. I couldn't get the screws out--they don't budge a bit--and thought, well, they'll loosen up. I've tried a few other times over the last year+, to no avail. Two months later...they are so amazingly tight that the Roommate, with all his brute strength didn't have any luck either, even after leaving some WD-40 on for 30 minutes. We're going to try a few more times (knocking on the screwdriver lightly with a hammer and trying with the screwdriver bit on the power drill). And if nothing works, I'm going over to Sun Sew & Vac, as tomorrow is my day off, and see if they have any luck. 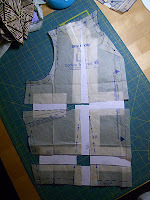 As you can see from above, I had to make a collar, and then make front & back facings as I changed the neckline a bit. (I made it a V-neck to accommodate the collar, and wanted the back to not be quite so high.) I had just sewn up one of the 2 collar pieces when the machine stopped working. Egad--will I ever get my narrow-wale corduroy dress? Waaaaaaa! That is a very wide-wail you're hearing! As Ms. Sewaholic had her readers write in about their favorite online fabric shops last week, I just wanted to mention that I bought 2 more yards of the fabric you see above (remember this is at least my 2nd or 3rd try on this dress), which was on sale for 1/2 price at joann.com. I had checked the store, but they were out of it. It came quickly, and I was pleased with the service, but then I'm not a real test-case as I had seen the fabric already in person. I'm not so sure about buying fabric completely online, though many Sewaholic commenters seemed to have quite good luck & have done it often. And the fish tacos we made when we got home? That totally took my mind off winter corduroy dresses! Music? Since I mentioned an (English) Beat album in the earlier, I feel compelled to use one of their songs, which fits quite well with this post, too: Save It For Later! A break from 7501: Fun Shirts! Anyway, it was another $9 or so to have a shirt made for the Roommate...so guess what?! He has about 30 of them (or is it 35? - we've never seen them all in one place). I thought you might like to see just a few of the fabric patterns. We call them fun shirts, you can probably guess why. Remember this? It's 7501, which I bought by accident, thinking I was getting Scruffy Badger Time's 7051!? Well, tucked inside (you'll see it mentioned on the front of the packet, too) is a Bonus Basic Pattern (in women's sizes). I'm not sure what that means, because I think it sounds like there's another pattern inside. 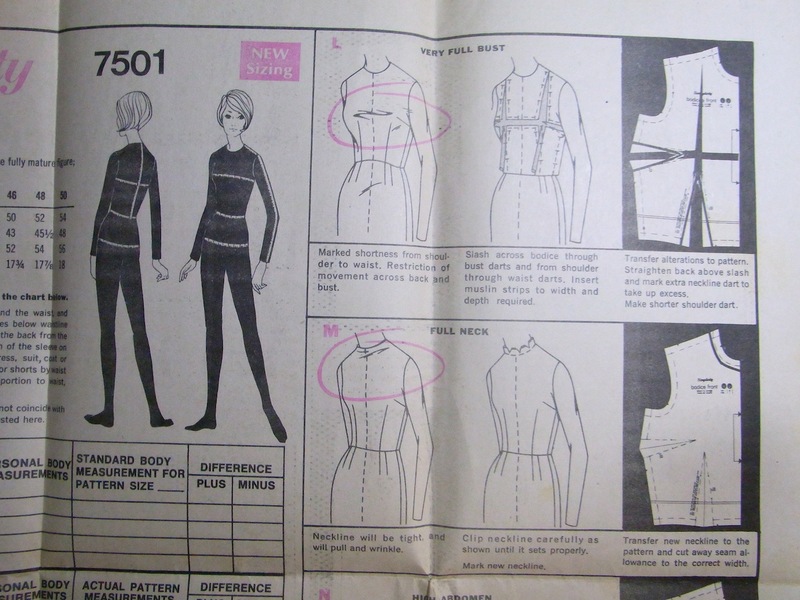 But what it does mean is that there is this groovy chart about how to get a pattern to fit. It has these cool drawings of 6 women (with wonderful haircuts--I want the right hand model's please), and you pick what usually happens to you when you put on a dress made from a pattern: Does it pull across the shoulders because yours are broad? Do you have round shoulders or a small bust? Then pick a drawing, and follow the pattern adjustment instructions to correct the dress so it's right for you. Now, if you've been reading about my struggles w/ 7501 (which is too big for me) and trying to turn it into 7051, you are probably wondering why I didn't go straight to the Bonus Basic Pattern right from the start. Well, I did read thru it, but then defaulted to my (rather lazy) typical response--things usually fit me pretty well and I've never had to make many adjustments except for hems & sleeve lengths (I have short arms). 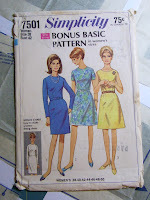 Also, the Bonus Basic Pattern is really about adjusting or enlarging a pattern, and I needed instructions for downsizing. So I read thru it & neatly folded it back up & put it into the packet. Weeks went by and I went thru 3 sets of toiles, trying to get the bodice right. (Read all about it here, here, here, here & here.) 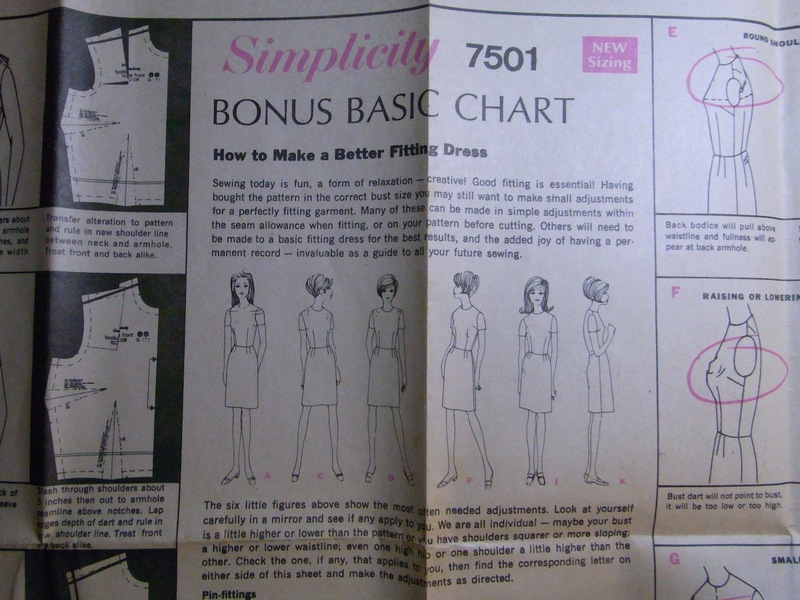 I finally gave up and decided to modify this pattern, Simplicity 9602, which is from my mom (I remember when she made it for an Xmas party) to give it a collar like 7051. And that ended up too small. So I added where I thought I should to make it bigger. And it turned out way too big! Honestly, I almost feel as if I've never sewed before. I have to keep looking at things I have made, that do look good to remind myself I'm not a beginner! See the top right where it says "very full bust?" That's me. So that's what I did, lots of slashing (I worked up my nerve by reading Tilly's Sleeve Slasher post a few times) and taping. I couldn't find any pattern tracing paper nearby (haven't been to G Street yet, though) so just made do with used printer paper. I drew 1" lines on the paper so that I knew things would match up, and started slashing. 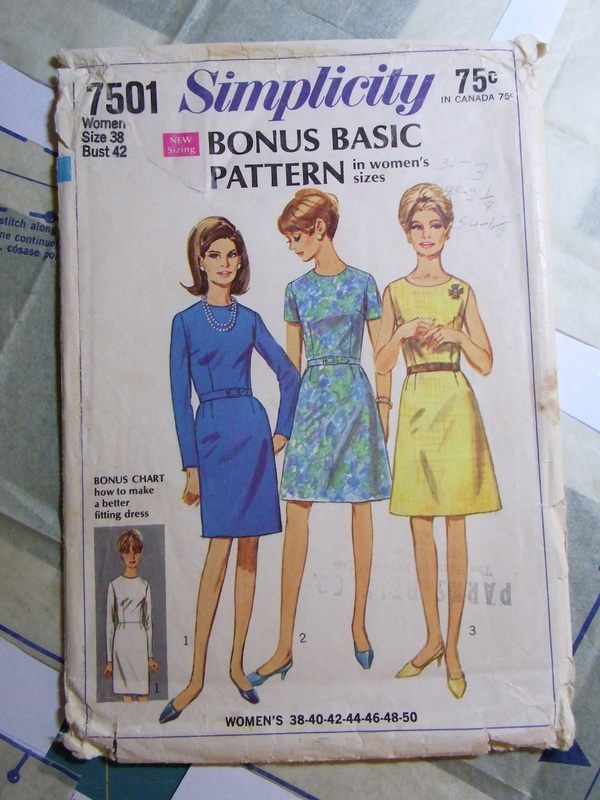 I reassured myself that if I totally screwed up, 9602 comes with a 2nd bodice pattern, which is a bit different at the neck, but is the same for the sleeves & darts. To the right you'll see my masterpiece, with all the bits measured & taped together. I found some weird polyester pale green stuff in a box downstairs...a real "Where the heck did that come from?" moment. But it should be fine for my 4th (yes, fourth) muslin. I've cut out the bodice & put all the markings on it; we'll see if I get to it this weekend. The New Domesticity?! A step back for women? This article was in the Washington Post last week, and the subtitle is Fun, Empowering, or a Step Back for American Women? First, I'm not sure why it's a step back only for American women; are the women in other countries so backwards they can't step back? But whatever, it's interesting that any traditional work calls to mind the good old days, when women were downtrodden & men were men. But I tend to think that any knowledge that makes us self sufficient is only that--knowledge. Knowledge you can gain from your grandmother, or a book, but it's useful stuff to have in your head. And if you enjoy doing it, why not? Why analyze? I say just enjoy & be glad you get something useful at the end of it. I tend to think I have a little different perspective on women's rights as I lived in Japan, Oman & the UAE for 11 years...in all three countries, women are well-educated, but have varying degrees of freedom & choices. And I live in the US, where there's a scary drive to put women back into the 19th century by taking away abortion rights and even birth control choices. I'm not complaining about the opportunities and choices & the fact that I'm paid a fair wage similar to my male counterparts, but I also know that whenever men (or women) start telling other women what they can do with their bodies, choices start disappearing quickly. I knit, sew, make kim-chee by hand and do lots of cooking. However, I do not do the laundry by hand, or clean my carpets by taking them outside and beating them--I've got a vacuum. I don't walk the 7 miles to work; I use the metro. I'll do whatever I can to make chores easier & faster; but for the "chores" I enjoy (is knitting & sewing a chore? ), I don't mind doing them the old-fashioned way. We do make our own yogurt--mostly because I want to know what's in it. However, I don't do it the way I did in Taiwan--over a gas pilot light on the stove--instead we have a little plug-in device. Same for the kim-chee: I want to put my cool stuff in it (chiles, caraway seeds, lemon slices), and would never buy any in the store. I never dream of pumping my own water (like my grandmother did) and the few times I've had to heat water to wash in (while camping or if the power is out), I think of my grandma to gain strength, but am glad it's a one-off. What do you think? Are we moving backwards? What chores are hobbies? What chores are chores? I'd love to read your comments! If you're at all interested in the Middle East, culture, food, music, history, architecture, whatever, I highly recommend Saudi Aramco World, a free magazine with amazing photography & articles that are guaranteed to enlighten you. So, in the latest issue, there's an article about fashion designers from the area, entitled Nouvelle Vogue in the MidEast, by Alex Aubry. The clothes are beautiful, but what really interested me is the fabric finishings, especially the embroidery, using traditional techniques on modern clothes. I clipped a few examples from the website; to find out more about the designers & see more photos, go to the article link, above. And check out the detail on the sleeve & shoulder of this blue blouse! First of all, I love that little sleeve dart to make such a nice cap over her shoulder. Second, the embroidery is so simple & interesting--and it makes an epaulette, sort of. This last outfit has more embroidery along the skirt. Very striking. I love that rich almond brown, & the red trim makes such a nice contrast.